One of the acquisitions I made at AMPS 98 was this new kit from Jaguar, which I picked up from Mary of M&Models. Since I had also just gotten the DML kit, this was a natural to go with it. Jaguar has acquired a pretty good reputation for its interior kits, and with this effort, it's no wonder. The kit is very complete, neatly broken down into logical subassemblies, and fills up the entire back end of the DML kit. While only the top of the engine block is included (two spacers fit under it and hold it at the right level), with the firewalls, fuel tanks, and spring mounts in place you can't see anything underneath it anyway, so this is really a fairly practical choice on their part. The instructions show what has to be cut away from the DML kit to get their parts to fit, but this particular kit needed a bit more. One side of the replacement rear lower plate (1) was filled in rather than left hollow, so it will necessitate trimming off the flange on that side of the DML kit to get it to fit correctly. Use a slow setting ACC glue to ensure that it spots correctly in this case. There are also no connections from the reduction gears (2 and 3) to the final drives (rear parts of 4 and 6) but this is hard to notice. The fan is pretty complex, but the method of assembly involves cementing the blades (parts 11-26) to the fan and rear firewall (part 8) with the wider "bracket" side against the fan. Note that there are very tiny tabs on these parts, which fit into the grooves, so do not sand the tabs off the parts when preparing them. Overall, this kit will necessitate some additional work, mainly in getting a set of etched brass grillework in order to show off what you can. The DML kit comes with removable rear access and engine access hatches, and the use of screening and open louvers will help display this installation. While no color guide is given, the bay itself should be white, the engine block light grey, the exhausts a rusted steel color, and most of the other components are pretty much your choice. The transmissions have been seen in either white or black, air cleaners black, the flywheel and fan in white or light green, and some parts have been "color coded" over the years for ease of maintenance (i.e. air system and pneumatic lines black, hydraulic lines red, electrical runs blue, fuel lines green, etc.). This set will spice up the DML kit, and with some work, will probably fit into the Zvezda kit, which shares the same basic, dimensions and proportions with the DML kit. It most likely will not fit into either the RPM or Tamiya kits as they have wrong angles and the parts are designed to fit perfectly into the correct DML hull profile. However, the Zvezda kit will need to have the various ports and doors opened in order to have visual access to the engine. 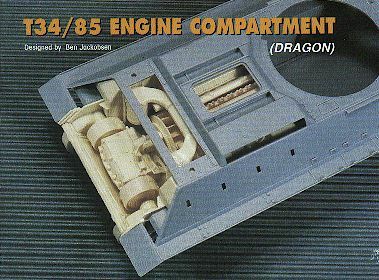 Jaguar also makes a front interior kit for the DML T-34-85, and while I did not pick one up (being sold out!) it is designed to dovetail into the rear interior kit for a perfect paring. Ben Jakobsen made the masters, according to the directions. Page Created 28 April, 1998.